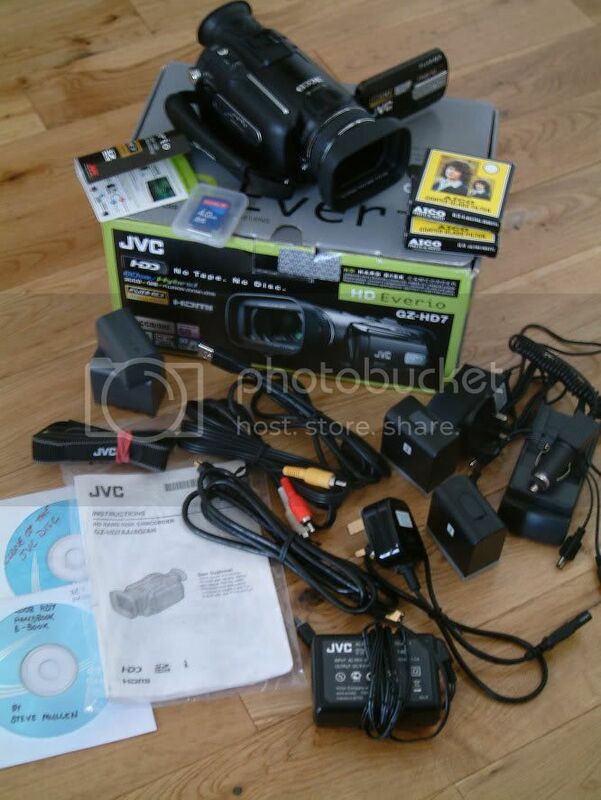 UK JVC GZ-HD7 FOR SALE + New Batteries, 4gb SD card etc. 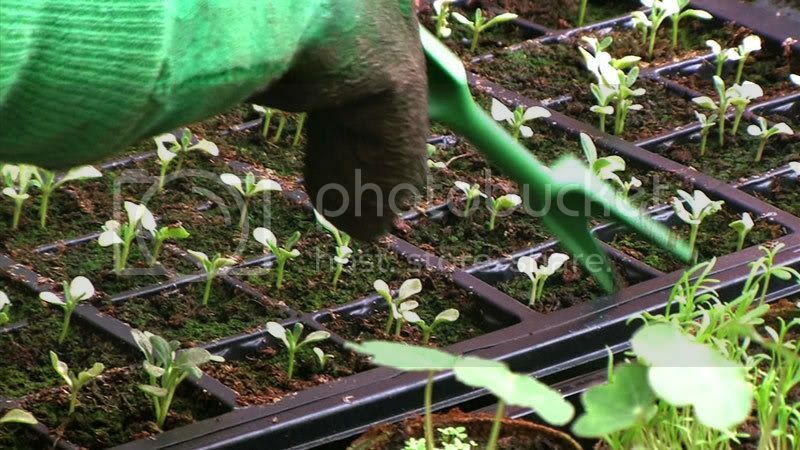 Gardening photo is a screen grab from video footage shot with the HD7 on Sunday. Other pics show actual camera for sale. The camera IS PAL FORMAT and is IN THE UK! Glasgow to be exact and you are welcome to check it out if you live locally, before you buy. It has had extremely light use. 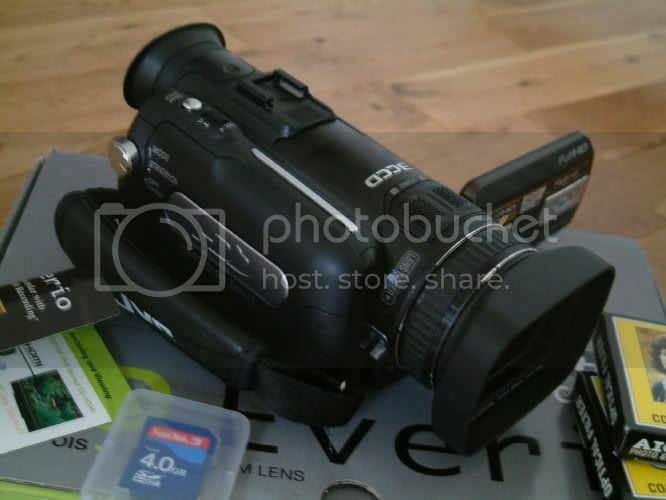 I used it for about 2 or 3 hours on Sunday and it was previosuly used to shoot 2 other evening length events. Probably about 12 hours use in its lifetime. It's virtually brand new as any quick inspection will prove. 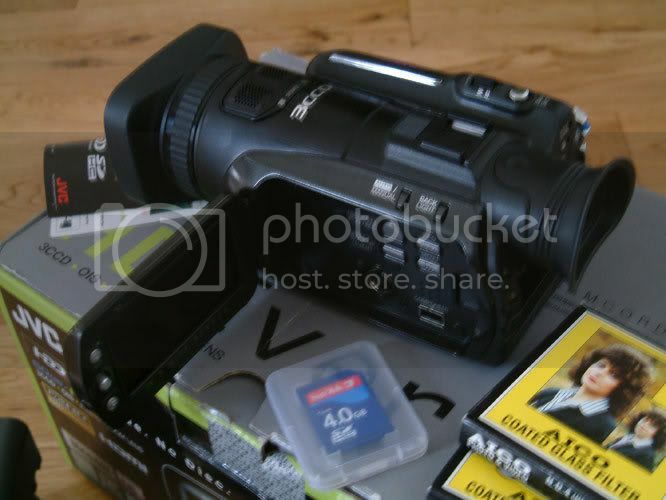 It comes with a firewire cable, a usb cable, an a/v cable, a small JVC data battery, a larger JVC data battery, 2 x large third party batteries (4-5 hours each brand new), a third party charger (brand new), a third party car charger (Brand new), the original JVC charger, a copy of Steve Mullen's 2008 e-book (bought last week) on CD, a clone of the original software disc (my copy went awol but this is identical), a san disk (recommended by JVC) 4gb SD card - Brand New and unused - which allows you to take stills with the cam (4gb is the largest the camera can take BTW), a JVC remote, plus a new glass ND4 filter and a new glass UV filter. MANUAL IS IN ENGLISH!!! ALL WRITING ON THE CAMERA IS IN ENGLISH!!! This camera is PAL. NOT A cheapo IMPORT CAM! Shop bought in the UK. Boxed. anyone out there with an almost retired cam???? Boom Pole has been sold. Thanks! Thanks everyone! The Boom Pole has been sold. Price lowered to $635.00 (price includes shipping to anywhere in the USA, and Paypal fees). I have a TRV-900 that is showing some signs of head wear. Firewire works and it records in SP mode pretty well, but LP is giving me some problems. BP-2L24H Battery price reduced to $42 each + $6 shipping. You can contact me takyc@hotmail.com for info. bump, selling them because I am going with 16 GB cards. thanks i am looking for a 3ccd pro level cam just old!